For his "Executive Decision" segment of Mad Money Friday night, Jim Cramer sat down for the first time with Garry Ridge, president and CEO of WD-40 (WDFC) , the California-based manufacturer of household products like WD-40, Spot Shot, 3-in-1 and more. Ridge started off with a little history lesson, explaining that WD-40 was originally created as a water displacement spray for rockets, thus the "WD" in its name, and after 39 failed attempts, it was the 40th try that was finally successful. Over the years, WD-40 has moved away from rocket chemicals and is now in the business of creating happy memories, Ridge said, as they solve problems in factories, workshops and homes around the world. It is a great story, but let's check out the charts and indicators. In this daily bar chart of WDFC, below, we can see that prices have been in a sideways consolidation pattern from August/September, and prices have traded in a tighter and tighter pattern. It looks like prices are at an apex. WDFC has traded above and below the shorter 50-day moving average line, but remains above the rising -- and slower-to-react -- 200-day moving average line. The daily On-Balance-Volume (OBV) line has moved sideways-to-lower since August, suggesting that sellers of WDFC have been more aggressive in the past six to seven months. The Moving Average Convergence Divergence (MACD) oscillator has hugged the zero line for the past two months and is poised to move up or down with the price action. In this weekly bar chart of WDFC, below, we can see a long base pattern in 2016-2017 around the $110 level. This base supported the rise to the $180-$190 area. Prices are above the rising 40-week moving average line, but we could see a test of that line in the weeks ahead. The weekly OBV line shows a long rise to December 2018 and then a decline. The rise is bullish, but the decline tells us that sellers have become more aggressive. The weekly MACD oscillator is in a take-profits sell mode. 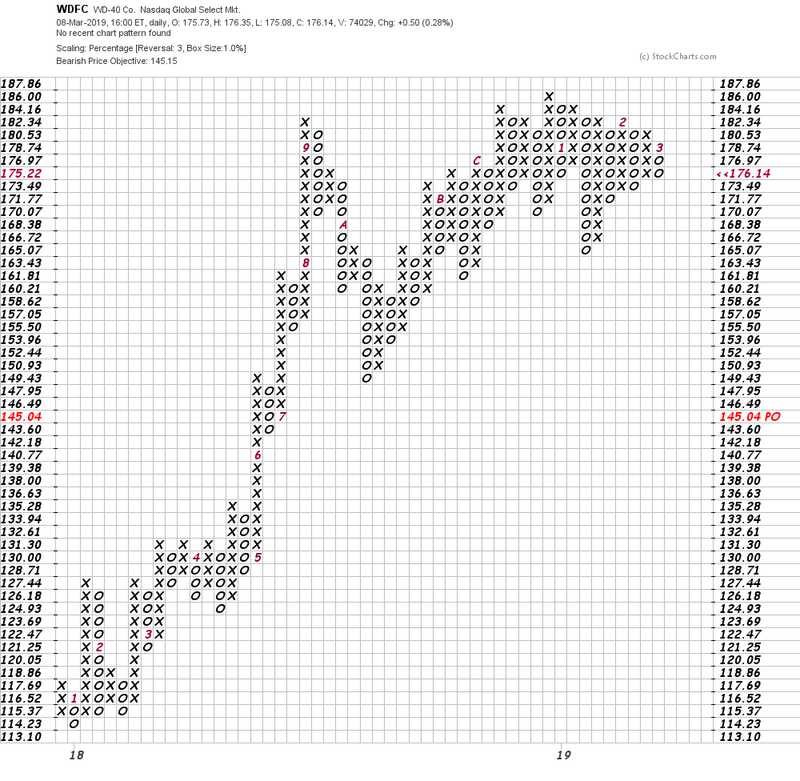 In this Point and Figure chart of WDFC, below, we can see a potential downside price target of $145. Bottom line strategy: To me, the buying and selling pressures appear balanced. A rally to $187.86 will turn the Point and Figure chart bullish but a decline below $165 will be bearish as it would break the 200-day moving average line and the January low. Be flexible.